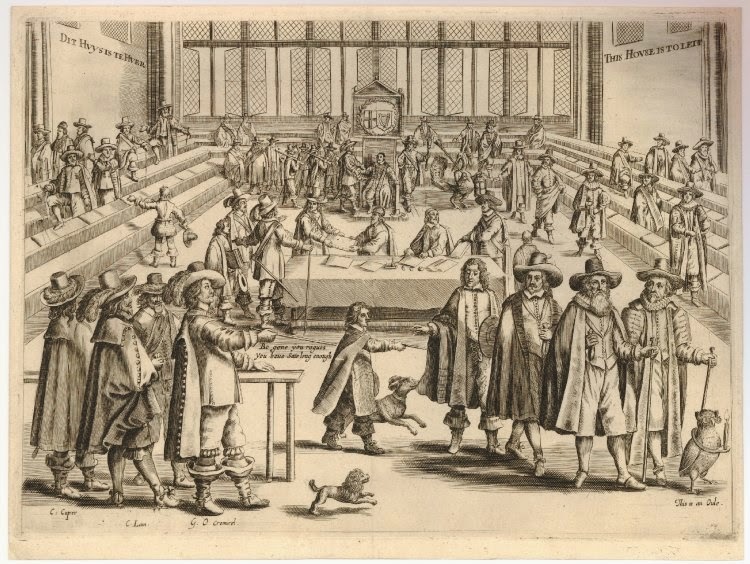 Oliver Cromwell dissolving the House of Commons. Engraving of 1653. There is a lot which should be said about the patronising attitude of Yoof-oriented liturgy and other events organised from the top down, in the Church. It is striking that those initiatives which have grown up from the grass-roots, for young Catholics, are of a very different character: the Faith Movement's events, the Evangelium Conference, the Juventutem movement, and the St Catherine's Trust Summer School and Family Retreat. Events organised without the big institutional money-bags, and the institutional links to corral clients from Catholic schools and parishes, live and die by their success with the young people themselves. We know, because we've done it, that children and young adults are perfectly happy with even quite a lot of liturgy and catechesis if it is not dumded-down, patronising, and embarrassing. The official Yoof ministry people can merrily put one generation of Catholics off the Faith and just move on to the next cohort of victims. Men, in a church or outside a church, while they are assisting at sacred rites, shall be bare-headed, unless the approved mores of the people or peculiar circumstances of things determine otherwise; women, however, shall have a covered head and be modestly dressed, especially when they shall approach the table of the Lord. It is interesting to see the obligation of men extended to outside events (such as open-air Masses), when men would at that time naturally have worn hats outside, whereas the obligation of women is tied more to the reception of Holy Communion. It's it odd that no-one seems to think that this obligation was oppressive to men, when in fact it would have occasioned noticeable discomfort in outdoor settings, either from the sun or from the cold, and represented a deviation from normal practice. Women, on the other hand, are effectively told: just do what you'd do anyway, wear something on your head. Today fashions have changed, and the obligation is no longer in canon law, though the Scriptural basis of the obligation, St Paul in 1 Corinthians 11, is still there, between 1 Cor 10 and 1 Cor 12. Since few people wear hats or anything else on their heads in the West, it is the practice of women putting something on in church which now strikes us as surprising. 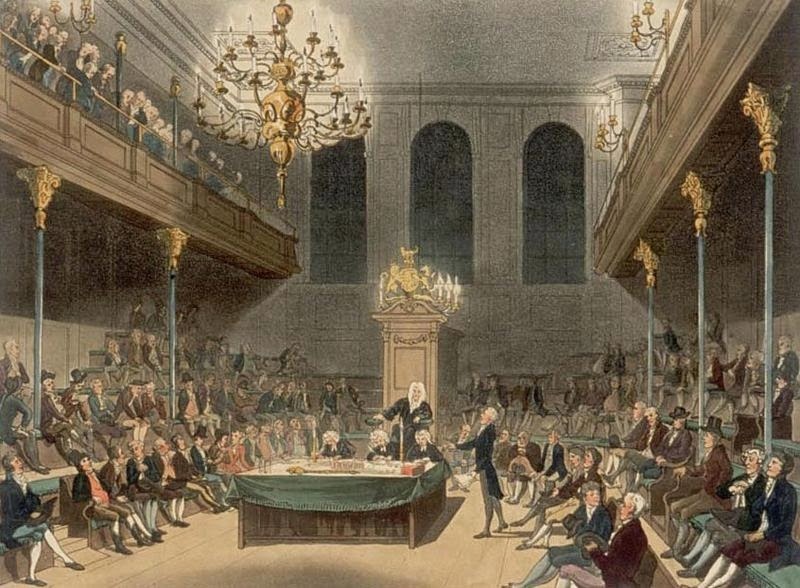 The only thing which has survived is a general sense that men take off their hats inside, which is actually quite a recent thing, as these drawings of the House of Commons demonstrate: men, like women, were entirely comfortable wearing hats indoors into the 20th century. Taking them off in church or, in Protestant practice, taking them off specifically for prayer in church, was a dramatic gesture. The contrasting obligations on men and women in Scripture and the old Code are the really interesting thing. I shall soon be publishing a Position Paper on this subject. How true this rings with me & the 'Yoof" Village!! Did you know that the word 'YOOF' is now a part of the dictionary? I have said for a number of years that the Youth Ministry Team (YMT) is a complete waste of diocesan resources. I'm pleased to say that quite a number of young people who have experienced it agree with me. Please don't chastise the editor of 'Northern Cross' (an Anglican) who reports without fear or favour whatever he feels the laity of the diocese should know. When you consider the closure of our seminary (Ushaw College) and yet see diocesan funding wasted on such as the Youth Village you have to wonder about the direction of the Church, not just in Hexham & Newcastle diocese but across the UK &, maybe, the world. Surely there were clergy present at the Mass celebrated by our bishop who could have seen to it that such a photograph could not have been taken, simply by telling the young man to remove his hat in church. 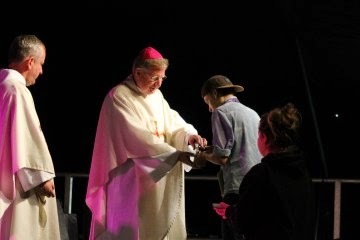 The shame is that the bishop, priests, and other catechetical leaders allowed a man in the Church with a hat on, and what's worse, approach the sanctuary with the altar gifts, with it on! !